1. Structure designed based on anthropotomy, with compact appearance, and easy to operate. 2. 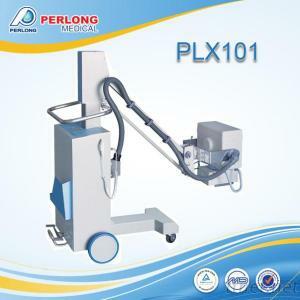 With high frequency inverter to emit high quality X-ray and low dose on skin. 3. With techniques of KV analog closed loop control, mAs digital closed loop control and micro-processing real-time control to ensure precision and repeatability of the dose. 4. With kV, mAs two button adjustment, LCD display, multifunction of safeguard. 5. With 50 preset exposure programs, and can be modified and stored by the user for convenient operation. 6. With a high-quality knockdown X-ray generator to reduce irradiation, which is much safer to environment and operator. 7. With a symmetrical beammonitor to adjust the X-ray field and a collimator lamp to locate the filed to ensure accurate radiography.